As mentioned in my earlier post about support hiring, one of my tasks was to get the support team off the ground for one of our products. 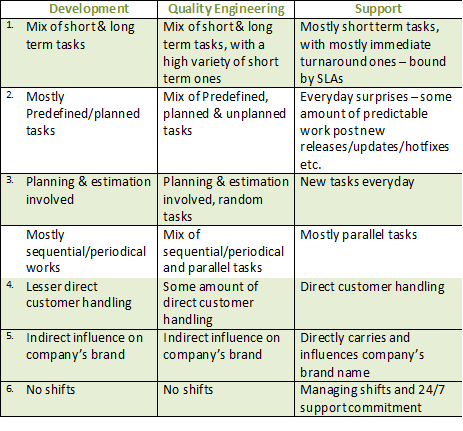 There are some key differences in how different functional teams like development, quality engineering and support team operate and go about doing their day-to-day tasks. This is not an exhaustive list but this understanding has several advantages that a manager can leverage for managing the team, collaborating with others, build a rewards and appreciation strategy that can result in building highly successful teams. Managers can also leverage this core knowledge to remove any biases if they are coming from different background and have more empathy towards employee behavior and develop risk assessment strategies. This entry was posted in Leadership, People & Culture by Hemant Khandelwal. Bookmark the permalink.